In preparation for My Talk at The Weavers Guild of Minnesota, with Sara Okern of Andas Mer, I’ve been pounding the reclaimed fiber!!! The particular rolags in the picture above are 70% Reclaimed Factory Waste Acrylic, 10% reclaimed silk, and 20% merino wool. I’ve been experimenting with blends quite a bit! I’m also getting much better at making rolags! You should have seen some of the first ones I made… not great, but they spun up just fine! Between packing for my trip, and getting all my ducks in a row, I haven’t posted much lately, but hopefully once I get back from my time in Minnesota I’ll post quite a bit of what I have been up to! Wish me luck! You heard that right! I’ll be back in the great state of Minnesota, giving a talk at The Weavers Guild of Minnesota on reclaiming factory waste. The talk is going to be at The Weavers Guild of Minnesota on April 19th! I’ll be doing the talk with Sara Olsen of Andas Mer! Don’t forget to grab your ticket for the event here! I’m so excited! I’m also excited to announce I’ll be teaching some classes with the Weavers Guild of Minnesota this coming summer! Start tuned for that schedule! Did I Tell You I’m Brewing Vinegar? Did I Tell You I’m Brewing Vinegar? — Because I am. It all started with kombucha, which is still going strong, but as I researched kombucha, and began to learn about what a scoby (symbiotic colony of bacteria and yeast) is, I found a bunch of information about vinegar. I love making my own hot sauces, which are all vinegar based, and I decided I had to start brewing my own vinegar. As many of you know, I work at a branding company as a production manager; I run the knitwear department. One of the things that we have a lot of are scarps from sewing the hats and scarves closed… Well, I’m trying to figure out how to keep the acrylic out of landfills. Now, hopefully I’ll be teaching this class at the Weavers Guild of Minnesota very soon. I would love to find other places where I can teach this weaving technique… Anyone know anywhere around Chicago? I don’t want you guys to think I’m slacking over here. I know I’m Eric ‘The Quilter’, but lately I’ve been weaving. Don’t think I’ve given up quilts though. I haven’t, just off on a new adventure. In fact, one of the things I want to do, is weave some fabric for quilting. 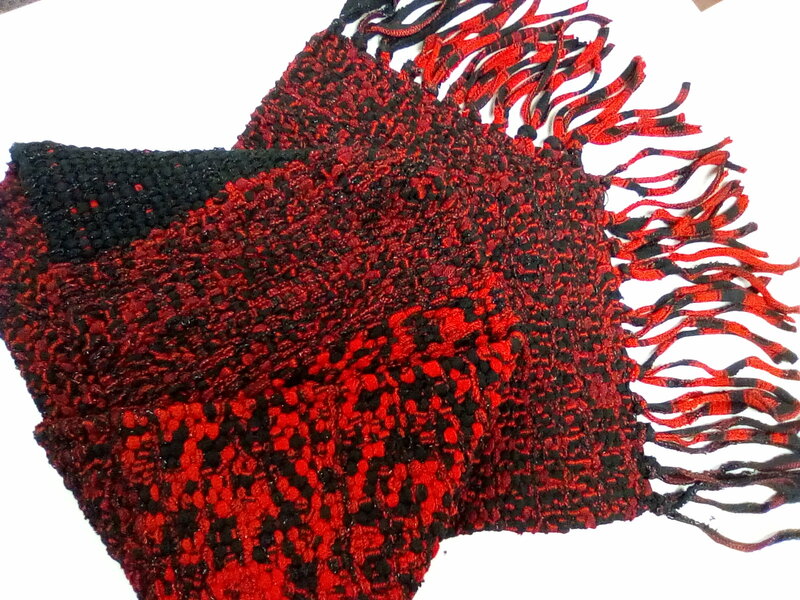 I’m honing my weaving skills so I can get to that, but right now I’m playing around with simpler weaving, like scarves. Also, I’m trying to use up some scarps from the factory I work at, but that’s for a different post. From Yarn Scraps to Fabulous! As many of you know, I work at a knitwear production facility, and we have so many scraps. I can’t stand to constantly throw them out, so I started reclaiming them. I’ve been using the drum carder, adding some other fiber, and spinning them into some amazing looking yarn. This purple, black, and yellow yarn is eventually going to be the warp on a project for my loom. I’m not sure what yet, but I’m always thinking about how I’m going to use it. A lot of you know I fly by the seat of my pants with projects, so I probably won’t know until I am almost finished with it! We all played that game at some point or another, where you pretend the floor is lava… Well, I captured that essence in this lovely scarf woven completely from reclaimed factory scraps. I rejected hats from work for the warp and the weft. It turned out even more lovely than I had imagined, and let me tell you what, it is so warm!!!! Follow the jump for more photos.